Selenium IDE does not have built-in commands to work with web tables and perform verification on tables as needed in tests. This post explains how to implement custom commands to test Web Tables using Selenium IDE. To create an extension, we need to use the selenium.prototype object and follow a particular pattern for naming the functions. As we are creating an extension to verify the table properties and contents, we need to prefix assert to the function names. Extending Selenium IDE is pretty simple. We can add new commands by adding functions to the Selenium object prototype, and the PageBot object prototype. On startup, Selenium IDE will automatically look through functions in user-extensions.js on these prototypes, using name patterns to recognize which ones are actions, assertions, and locators. 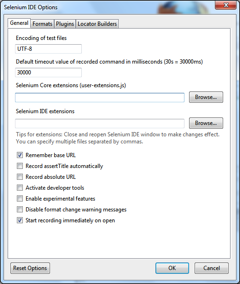 Selenium IDE commands are restricted to a three-column format. However, some commands might need more information to execute the command. For example, we created an extension for verifying the Cell data. This command needs the row, column, and expected value. We can specify these parameters in value argument by separating parameter values using a pipe character “|”. Inside the function, we can then split this string using “|” and pass the values to appropriate variables. Hi, thank you for very helpful article. How to call command line external tool from custom action. For example i want to run dir in command prompt and get stdout result in text. but it raises TypeError: document.require is not a function.